With its neutral tone and natural feel, this Japanese dinner plate is guaranteed to be a wonderful addition to your dinner table. Large in size, this plate is a must-have for any main course. The uniqueness of this Japanese dinner plate stems from its design, as pale green and brown Spanish moss seemingly grows on the plate. The brown, naturally waved edge of this plate is perfect for better grip, as the plate’s durability makes it heavy to hold. The plate also has subtle ridges on its surface, which are made to replicate ripples on the water. With this bumpy texture, any dish that you put on this plate is unlikely to slip off, making food preparation easier and less worrisome. 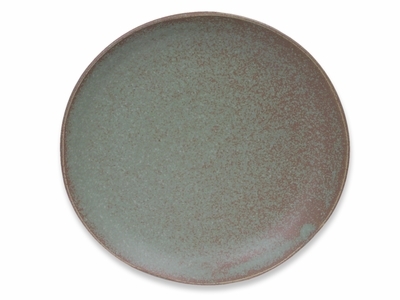 Crafted in Japan, the charm and matte texture of this wonderful plate makes it a wonderful addition to your dining table. The Japanese dinner plate’s earthy feel is great for any nature-lover. This enchanting plate also comes as a dinner plate set of two, which is packaged in a gift-wrap ready paper box.